On this forum we’ve had numerous discussions about various combative contexts and how what works very well in one context can be disastrous in another. There is no universal “one size fits all” solution to all the various forms of fighting, conflict and violence. To my mind, asking if a given method, technique or tactic “works” without defining “works for what?” (i.e. the context) is fundamentally flawed. Even in the world of “real violence” there are many differing contexts i.e. working as a bouncer is different to working as a prison officer is different to civilian self-protection is different to body-guarding is different to domestic violence and so on. We need to accurately understand the nature of the environment(s) we are preparing for and to clearly define our objective within that environment in order to know what will work best. It’s only when we understand and have carefully defined the problem that we can propose the best solution. All that seems pretty obvious, but that’s not how it tends to play out. Within the martial arts / self-defence world we often see “solution defining problem” as opposed to “problem defining solution”. What I mean by this is that people will take any given skill set (normally one they are personally invested in) and then work backward to reinvent violence in the hope of convincing others (and themselves?) that the solution they already have / want (even if it is the answer to a different question) is the ideal way to approach all contexts. This is particularly prevalent when it comes to self-protection. As an example, I’ve came across many karateka who will try to make the case for one-step sparring (of the “single lunging punch from 10 feet away, stand there and let the defender win” variety) and it’s relevance to self-protection. To do this they need to reinvent violence as the “one step methodology” does not work outside of one step practise. Some will take a step back and say that such practise is really about “principles”, timing, distancing etc. However, this is also flawed as it is logically impossible for non-applicable techniques (as we see in one-step practise) to be based on applicable principles; in the same way you don’t get an apple tree growing from an acorn. When principles become manifest in technique, those techniques always reflect the nature of the underlying principles. One-step “principles” are therefore not the same as self-protection principles. The timing and distancing of one step training is also different to the timing and distancing of violence in a self-protection situation. Violence needs to be reinvented in order to get the pre-existing “solution” to fit. It’s not just traditional martial artists who do this either. For example, we can also see MMA people making the case that deliberately taking a situation to the floor is fine in a real fight. The good MMA people I know, who also have an interest in self-protection, fully understand context and will state that submissions and staying on the ground are for use in the competitive environment only. However, there are others who, like their traditional counterparts, will reinvent violence to fit their favoured “solution” i.e. “most fights end up on the floor anyway” (even if that was true it does not mean you should actively seek it), “you can’t fight more than one person at a time so training one on one all the time is fine” (escaping is generally the best option and constantly seeking to engage and fight to the finish runs counter to that), “in a group situations people tend to fight on a one on one basis” (no they don’t and career criminals are not looking for a fight but to get what they want without a fight), and so on. The point is that “square goes” are not the same as the violence faced in self-protection and they have differing objectives too. To make competitive MMA the ultimate self-protection solution we again see a need to reinvent the problem so the “solution” can fit. Factions within the RBSD world are also guilty of reinventing violence. An example is the kill or be killed, better to be judged by 12 than carried by 6, street fighting stuff. “Street fighting” is a term that I’ve never seen accurately defined by those that use it. The problem with this is that “fighting” is not the best solution to civilian violence; therefore “street fighting” is not the same as self-protection. Vital skills like threat awareness, escape, de-escalation, knowledge of law, etc are not parts of “fighting”. Further, protecting yourself from potential violence / violence is legal. Fighting in the street (as good a definition of “street fighting” as any) is illegal. Revelling in the brutality of violence and the many ways in which maximum harm can be inflicted without ever touching upon how that violence can be avoided is again reinventing the problem in order to have extreme levels of violence as the only solution. This approach promotes engaging in avoidable violence which could lead to unnecessary injury, legal problems and even death. There is also something very unhealthy about it. Despite the claims to the contrary, “street fighting” is not a practical solution to the reality of civilian self-protection. Violence within a civilian context is again reinvented to remove all legal consequences and to ignore the non-violent solutions to violence (awareness, avoidance, escape, de-escalation, etc). Solution is once again defining problem. Within my study and practise there are many things which have no or little relevance to self-protection. I enjoy a degree of “art for art’s sake”. Aside from the application / bunkai of kata, I like the way solo kata practise makes my body feel. I have enjoyed the physical chess of sporting ground-work. I enjoy exploring the combative methods of antiquity. I like the “play fighting” of the dojo. They are all fascinating to me and they are fun and rewarding. I don’t need to reinvent violence in order to justify my practise of them. They bring their own justification. If we want to practise things just because we want to practise them what is wrong with that? Why the need to manufacture a link to self-protection? If we truly want to address the reality of self-protection we first need to understand the problem and then ensure our solution flows on from that understanding. We also need guard against the propensity for “solution defining problem”. Finally, we need to move away from the desire to always justify all aspects of our training and practise by reinventing violence in order to generate links to self-protection for everything we do. This is a topic I feel will be interesting to explore and I’m interested in everyone’s thoughts on the reinvention of violence and “solution defining problem”. As part of that, I’m also interested in why people feel there is often this need to make the link to self-protection for all areas of training? What is wrong with doing something because it is interesting or fun? What is wrong with training for fighting within a given context (sport / set of rules) and openly and honestly not caring about its relevance to self-protection? What other common examples of reinventing violence have people had experience of? Why is “solution defining problem” so common? I hope this will be an interesting and useful thread for both members and visitors. Great stuff Iain...here's my opinion on why it's so common for us to have these lapses of thought. Since MMA came to prevalence in the 90's there is a culture of "prove it" for traditional martial arts I think. In many ways this is good of course, it gives the average person maybe a bit better "BS meter" to work with when window shopping, and ridiculous things that would have not have made people bat an eye 20 years ago, today stand out clearly as fraudulent. On the other hand, it also makes people rush to define every practice as directly related to combat..which is somewhat nonsensical, as there are all kinds of things done in various arts that can't be directly linked to application, as there is much more to learning functional martial arts than just learning direct application! While it might not have the visceral allure of learning to directly hurt people, I think in almost all martial arts there is alot to completing a skillset that could be called "art for art's sake" - at least when taken in an isolated context. I guess the important part there is to understand what stuff does, and what it doesn't. As an example, while the groundfighting "chess game" might not be directly applicable to self defense, it can give the practitioner a level of mental (not to mention physical!) flexibility that can certainly impact "real" application. Similarly, practicing against a single, committed attack can be a starting point for studying how to move with impetus efficiently to better position. Neither one of these things is the same as "fighting" in terms of being direct replication of physical combat..but very few things do that anyway. The point is that there is plenty that will affect competency in your art, and maybe even your 'self defense' that is not directly combatives. Naturally plenty of these things cannot take the place of 'scenario training' or similar that is meant to be a closer approximation of reality, as long as the purpose and limitation of what is being done are understood, then all is good! The thing is, very little in training is even meant to be a one to one reproduciton of violence, nor are reproductions of violence the only neccessary ingredient in good training, far from it! So, if we often approach training methods as if they are supposed to be this, we will misunderstand the purpose of what we are doing. None of this is meant to diminish the importance of training for realism, only to say that a function of realism is actually knowing what you are doing and why. Iain, as far as an summary article I believe your remarks are 'spot on' as they say. This is an excellent expansion of the relevance of your 'martial map' concept, which I have personlly found to be a highly useful illustration... After explaining the concept, I actually have Level 1 students 'place' themselves and thier area of interest on the map; mostly to gain a perspective of where they are coming from and how they are approaching training. If I could offer a small criticism of the MM/ well-intended suggestion, it is the idea that the 'center' zone is somewhat 'vaguely defined' to me, which I initially found to be problematic, and which I believe is related to the ideas you are articulating above If the center zone of the map is understood to be the 'perfection' of balance between 'all' forms of combative contexts, then as you note above, the idea of a 'perfect' balance of contexts is probably a physical impossibility... if it were possible to exist, then there WOULD exist some sort of 'one size fits all' martial art. Further, I realized in thinking about it some that such a 'balance' of perfection can only ever be a PERSONAL evaluation made by an individual, precisley because there is no 'perfect' art... what is 'perfect' to one individual based upon their apporoach to combative context is likely 'flawed' to the next person who might be attempting to train for a different personal context. This is most easily illustrated by the idea that what is 'perfect' training for a jujutsu tournament is likely flawed training for a karate tournament, (etc. etc. ), or, more euphemistically by the idea of bringing a knife to a proverbial gun fight. Therefore, when I explain your excellent concept of the map to students, personally, I introduce the idea that the student and their individual goals and objectives occupy the physical center of the three spheres you define. Previsouly, before your Venn diagram, the best articulation I had found in terms of articulating the 'totality' of training paradigms was Paul Vunak's inter-related concepts of 'self-preservation' and 'self-perfection' oriented training. Partly, however, I never believed his model fully articluated the athletic fighting context. Likely, by my estimation Vunak would simply classify athletic fighting simply as a subset of self-perfection oriented training, and yet, as an intellectual point, that did not seem 'complete' enough to me... for instance how did one articulate the use/ application of an athletic form of fighting USED in a self-protection context, for instance say police judo? That always bothered me somewhat, but as I said, for some time, his was the most complete depiction I had encountered and I still see a lot of value in it. However, I now find the model you have proposed to offer a more 'complete' graphical depiction of the full specturm of human combatives, while still encompassing Vunak's ideas rather well, i.e. his concepts 'fit' within yours, while your model offers what I believe to be a more complete graphical depiction of 'all' forms of human combatives training. I was not kidding when I told you what a piece of brilliance I really beleieve the MM is, precisiely because it does illustrate so well that a person needs to 'know the fight they are training for. Returning to the suggestion of further defining the student's personal goals and choices as the physical 'center' of the map, it then becomes further possible to see that the student has many 'options' available to them in their pursuit of DIFFERENT FORMS of human combatives training. i.e., Since there ***IS NO*** 'perfect' blend at the systemic level, the only 'perfect' blend can be created at the individual level. (This is different than I was suggesting previously where the student attempts to 'locate' their primary area of interest on the basic MM). So, given whatever context the student is pursuing, the MM gives a graphical interface for them to 'see' that all forms of training are 1) not exclusive and to understand thier interelationships, and 2) that some take you in particluar 'directions' more than another which may or may not align with individual goals. This divergence of goal and method may be an easy concept to grasp intuitively, but I think as your article notes above, there are a lot of claims that misdirect people into THINKING and BELIEVING that they are training for one fight when in fact, they are training for another. So, following this line of thinking, contrary to popular misconception, if all training is understood to be the personal balancing of indivudal choices and methods, there is nothing 'wrong' with undertaking ground fighting training if you are pursuing a self-protection context--- ***provided*** that you UNDERSTAND and approach that form of training WITHIN its appropriate context. Further, I believe such exercise allows students and instructors to see the potentiality of 'overlap' between zones on the map. i.e. Ground fighting ***IS*** an appropriate skill/ ability for a self-protection context, ***PROVIDED*** that it is approached within THAT specific context. In other words 'self-protection-oriented' ground fighting is NOT the same kind of training as 'contest-oriented' /submission ground fighting. But, likewise, yes, it is ALSO true that there IS overlap between zones, which the MM allows for a simple articulation of. So, looking simply at 'drill X', the student / instructor (preferably the latter, but valid for both), can 'place' a drill and its training orientation within a context more specifically and easily. And as I said, while such an exercise is 'entirely academic' in terms of actual skill DEVELOPMENT, I still find it useful all the same, especially from a curricular design / lesson planning standpoint. Finally, on the basis of suggesting definition of 'the center' as 'personal' space, a second related suggestion is introducing the concepts of 'proportionality' and 'time'. What I mean to suggest here is, say I am undertaking training in art X, we'll call it karate. The way it was taught at the school I learned karate at, there was training ***AVAILABLE*** to me for ***multiple*** fight contexts--- for tournament contests, for ring fighting (this was pre-MMA), for self-defense, and for the sake of 'art' (/ health/ relaxation/ self-discipline, weight loss, etc. etc.) --- all of it labled equivalently "Karate". If the 'perfect balance' of any art is understood to be a development of ***THE SELF*** based on personal training choices, using the martial map, a student can look at 'any' instructional perspective and evaluate the 'relative proportional balance' between contextual spheres OF that perspective. i.e., the 'circles' you use to depict the three contextual zones can 'expand' or 'contract' graphically based upon the 'weight' given each zone by the individual instructional perspective... In this way, one can illustrate that you can have two instructional perspectives, both called "karate" or even "shorin-ryu", and yet, the proportional 'sizes' of the different 'bubbles' can be entirely different. Further, going back to the individual, such an expansion and contraction of training focus can 'vary' over time. i.e. THIS YEAR, my contextual focus might be on athletic ring fighting, placing me solidly in the sport fighting context; but ten years from now it might be on 'self-perfection' through meditation, based exclusivley on the choices that I pursue. This again becomes useful in understanding how instructional perspectives change and vary as we change over time: the overall training 'mix' is simply rebalanced by the indivudal. By allowing for the indivudal growth/ contraction of the contextual spheres over time, the MM also becomes useful as a diagram / tool to understand the focus and balance of individual training over the life time of an individual. So, in conjunction with the article, what I am trying to articulate is that I see the MM as having two separate and distinct 'uses'... i.e. it can provide an analytical tool to 'graph' any instructioanl perspective at a given point. And likewise, it can be used as an 'active' planning tool in either curricular development or personal self-development. his is because in both cases, it becomes a very simple graphical tool for expanding one's understanding of the various differences and relationships BETWEEN different combative contexts. So, like Tau said, I think you have good seeds for an additional podcast, in which I'm suggetsing you might relate or extend the original ideas of the martial map. Hope you find the suggestion useful, it's meant to be helpful and related, not cirtical. I agree with a lot of what is being said; however is it possible we could be over complicating and over analysing training methods when it comes to dealing with violence. If I have a certain skill set or maybe no skill set at all and I have to protect myself no matter what the context a solid punch to the temple or a knee to the groin should be effective enough for me to get away or possibly control the situation. Is there something to be said about just believing in yourself and your training ? I'm just wondering as experienced martial artist if we tend to complicate things once we start to acquire more knowledge. I've always believed in just keeping things simple and doing. Maybe I'm wrong though. I really wish I could give a long detailed response to this. But the above quote sums up my answer neatly. The majority of my current training is for the purpose of becoming more fit, and better understanding practical application of my main style. But I enjoy a lot of other aspects of what we do as well. There have been times I went to training for no other reason than I enjoy the company of the people who are there. When I went to classes which were going to be nothing but One-Steps or plyometric training (activities which I do not enjoy at all), this was the reason I would still show up - the people. Now, regarding why people need to create a connection to self-defense/self-protection, I think it is the reflex leftover from our teens when we stopped admitting that we did things just because it was fun. Adults tend to need to show they have a purpose to what they are doing. It is not okay to enjoy nonsense after a certain age. This is an excellent topic. I have often wondered about the huge disparity between the way real assaults play out and the technical, precise, assumptive way that so many experienced martial artists teach their idea of self defense. I could never understand the psychology or motivation behind their actions. Ego? Money? Ignorance? But I like the way Iain explains it. Basically, they have a solution looking for a problem. 1. Those who dwell on violence and glorify it usually have never experienced life threatening violence, first-hand. 2. Violence never occurs/happens the way we expect/want it to happen. 3. We always want to make the fight fit our training, instead of our training fitting the fight. 4. War stories are a dime a dozen and usually indicate the person has little, or no experience. 5. Peace of mind and good health are probably two of the best reasons for practicing karate. If you're wanting self-defense/ home defense buy a gun. Its far more effective, though will land you in jail if used improperly. If I have a certain skill set or maybe no skill set at all and I have to protect myself no matter what the context a solid punch to the temple or a knee to the groin should be effective enough for me to get away or possibly control the situation. Is there something to be said about just believing in yourself and your training? That’s something that is very important to consider. A low number of developed high percentage techniques is of course basically all we need physically, but we still have a need for threat awareness and assessment training, de-escalation skills, knowledge for the law, home security, mobile security, an understanding of crime, etc. We also need the “when to use” and the “how to use” (both of which are context dependant) as well as the “what to use” (i.e. the actual physical technique). These things are needed for genuinely practical self-protection training and their omission from much of self-protection training (typically when delivered by martial artists) is problematic. The aim must always be to make things as simple as possible; but no simper. I would therefore say that stating that a single punch is all that is needed for true self-protection is overly simplistic. Martial artists who claim to tech self-defence are prone to this though as they generally only have a physical solution, so they reinvent to the problem to be entirely physical i.e. only the physical bit is covered and what leads up to physical violence and what follows it, although very much vial parts of the totality of real self-protection, are entirely ignored. As per the original post, it is “solution defining problem”. If I could offer a small criticism of the MM / well-intended suggestion, it is the idea that the 'center' zone is somewhat 'vaguely defined' to me, which I initially found to be problematic, and which I believe is related to the ideas you are articulating above If the center zone of the map is understood to be the 'perfection' of balance between 'all' forms of combative contexts, then as you note above, the idea of a 'perfect' balance of contexts is probably a physical impossibility... if it were possible to exist, then there WOULD exist some sort of 'one size fits all' martial art. 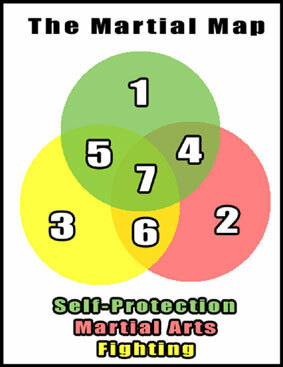 As per the Venn diagram, the centre spot is a part of self-protection, a part of fighting, and a part of martial arts. Therefore whatever exists within that point can never cover the totality of those three areas. If someone is training solely in that centre area, it is by definition incomplete from every perspective. It does not represent a perfect balance and it is far from being the mythical “one size fits all” solution. It represents things that apply to all three areas, but would still be partial when looked at from the perspective of the three areas independently. As an example, training for a good punch is relevant to fighting, self-protection and martial arts, and hence such training would belong in the centre spot. Just having a good punch would not give you the totality of what we need for any of the three areas though. Such training would be incomplete and partial by definition and should not be thought of as covering the totality of self-protection, fighting or martial arts. I hope that helps clear up what I mean when I conceive of that centre area? I was not kidding when I told you what a piece of brilliance I really believe the MM is, precisely because it does illustrate so well that a person needs to 'know the fight they are training for. Thank you! That’s what I use it for. When teaching and training I will cover all of those aspects. Where people can go wrong, in my view, is that they do not define what they are training for (i.e. where a given part of training would fall on the map). I try to avoid that by being clear on what is self-protection training, fighting training and martial arts … and where and how they overlap if something would fall into more than one area. As I said in the podcast, many fail to think about this and infer, state or believe that fighting = self-protection = martial arts. That as many problems – such as the need to reinvent violence being discussed in this thread – but it is easily avoided and keeps us goal focused if we seek to be clear on context. I’m hoping to add a written version of the Martial Map to this website as soon as I free up the time and I will be looking to tighten it up. Feedback such as this is very useful in that regard. Thank you. So, like Tau said, I think you have good seeds for an additional podcast, in which I'm suggesting you might relate or extend the original ideas of the martial map. Hope you find the suggestion useful, it's meant to be helpful and related, not critical. Well seeing as you’ve seconded the idea I think I need to write a podcast on reinventing violence :-) I’m on it! It is a shame this forum does not have 'like' or 'thank you' buttons. I've found every post so far to be interesting. Iain - you mentioned the need to keep things "as simple as possible, but no simpler". I agree, but even within this there is a problem. It is a problem for insturctors more than for students. To deliver the most effective programme for any purpose, whether self protection, self defence, competitive sport proficiency, physical fitness (of many kinds), self development etc... is in reality a very complicated matter, requiring a great deal of knowledge, even if the programme the student engages upon appears relatively simple. Generally the more simple the programme, the more complicated the levels of research behing it! I like the Martial Map. Looking at that I can see how the majority of my early Shotokan training fell into 2 and 6. My Aikido training into the same. The Heian Flow System into 6 and 7, and what I currently teach in DART into 1, 4, 5 and 7. Those are of course personal opinions, not statements of fact. One thing I have found fascinating is the presumptions that many martial artists seem to have that come to the fore when I say that I'm teaching self protection. They wonder why students would want to attend more than one class a week. I find it interesting they they don't realise that students might enjoy and find the physical self defence skills and drills as fun and interesting and challenging as students might find the regular drills in their own martial system. It is horses for courses. Why do people feel the need to create a connection to self defence in the martial system they do? I think there could be many reasons. Some feel that without a martial connoctation, whether sport or self defence, what they do is merely frivolous. It justifies for them their chosen form of exercise. Some asume that because their skills work in particular rulesets and environments they automatically transfer. It is rare to find someone who admits to training just because they enjoy it! I think that's a shame. I predominantly teach self protection and self defence. I don't intend, or expect to be in a fight ever again. I'm happy to say that I do what I do because I find it interesting and fun! Well, now that you have clarified, Iain, I have to admit that there are many things that would 'apply' in all domains. So, (while I'd maintain there might be some value in the perspective I was attempting to suggest), it makes a lot more sense to me now... approached simply as 'things that are common between zones' there are certainly a lot of these to be found in whatever given system. In fact, at another level, it becomes possible to see a systemic 'art' or instructional perspective as being the center, the 'common area' between fighting, self-defense and martial art, especially if the various bubbles are understood to be directional objectives, and even more so if one were to allow the proportional 'resizing' of the bubbles... so Instructional Perspective 1 (Bill's Shotokan) would exhibit a different blend than Instructional Perspective #2 (Mary's Aikido)...yet each would exhibit a (proportionally different) inherent 'commonality' between all three primary combative zones. Again, its your baby, I am just trying to share what I saw within it, not rewrite your initial concept, hope that's clear. I would welcome further development of this as I truly believe its the first model that I have encountered that shows WHY there is so much confusion and argument about the notion of 'what is valid/ best for what'. Think of all the discussions we have had around here that have started from that very idea---the highly personal relative 'appropriateness' of Item X (whether mechanic, instructor or system) for context Y (the cage, the mythic street, ground fighting) etc. Change a variable, and everything that is consistently 'true' about one fact pattern changes, effectively and simply GRAPHING **WHY** the age-old answer "it all depends" is so frequently prevalent. I'm surprised that apart from Michael (post 5) few seem to mention "self-belief". To me that is far more important than 'Do', 'Jutsu', 'Sport, Self-Defence or any other label. Put simply, wherever we are on the diagram, no matter what tricks we learn, we need to believe deep in our subconcious that we can do it in a crisis. I lost my self-belief for a while (following illness) and tried a few different things thinking they'd bring it back. None did. So now I've gone back to my first love, knockdown training. It's not a 'complete' system, nor am I the baddest baddass on the planet, but I don't care. I enjoy the training so that's enough for me. With a sensible diet, bag work and strength regime my impact levels are high again and I feel that old controlled aggression coming back. Will it work? I'd rather not find out, thank you, but I believe I'm far more effective now than I have been for years. That'll do. It's not a one-size-fits-all approach, but why overcomplicate? Gary, I think that's a really good point, if we really want our training to work when we want it..seems like confidence definitely matters alot. On the other hand, for every person who has been confident and seen their skills succeed, i'm sure there is another who is equally confident, and whose skills failed them anyway..so, while it's integral, maybe it's a bit of a double-edged sword as well? I don't know and I suspect few do for certain. We can't learn enough skills to an instinctive level to cover every eventuality unless we are prepared to devote our lives to training. For most of us that's not realistic so I believe a few things done very well is a good compromise. I may be very, very wrong and no doubt there are more effective answers. That way seems to suit me best though. I agree on all that for sure, This ties in well with what Iain mentions earlier though, how simple is "too simple". I admit I am a person that probably tends way to far in the direction of simplicity. If I knew the answer Zach I'd be worth millions. But I know that for me (at 56 with a family) I haven't got time to train in everything to the level of unconcious competence. So I choose to hack away all the tricky stuff and do my best to be very good at a few things. Will it cover everything? Probably not. But at my age I'm more likely to die of an age related disease than being stabbed working on a door, so the health and fitness benefits of solid sweaty training are more of a consideration. I realise I've strayed from the OP (sorry Iain) but my core point is that a few skills you believe in may be better than 100's you only know to a reasonable degree. That way of training is simpler, but not easier. It's certainly less time consuming. Iain - you mentioned the need to keep things "as simple as possible, but no simpler". I agree, but even within this there is a problem. It is a problem for instructors more than for students. To deliver the most effective programme for any purpose, whether self protection, self defence, competitive sport proficiency, physical fitness (of many kinds), self development etc... is in reality a very complicated matter, requiring a great deal of knowledge, even if the programme the student engages upon appears relatively simple. Generally the more simple the programme, the more complicated the levels of research behind it! That’s a very good point! The instructors I’ve trained under who have really impressed me have always had that ability to organise and simplify. They are able to bring out the core concepts and teach in very time efficient ways. Simple is not easy. I guess an analogy would be technology. The people who built this PC know way more about computers than me. The people who wrote the word processing program I’m using understanding it on a far deeper level than I do. However, those people have used their knowledge to make things easy for me to use. It’s very simple and highly functional, but that is entirely due to that fact it has been made that way by people way more knowledgeable than me. The software could be made simpler, but if that was done it would lose some of the functionality I may need i.e. Notepad is simpler that Word, but it lacks the functionality to make quality documents. Self-protection instructors (and software developers) need to indentify exactly what is needed and then construct a training plan to address all those needs. It should be made as simple as possible for the student to understand, absorb and use; all the while ensuring that it is not make so “simple” that required functionality is lost. As you say, that’s not an easy task. Absolutely. Your earlier points about individual goals / growth also play a major part here too. If Bill were to only practise kata because he liked the way it made is body feel, he found it relaxing, and he found it helped with his flexibility and mobility, then his intent has moved his practise into the “martial arts zone”. If however Bill practised kata with the intent of improving efficiently of motion for combat, anaerobic combative conditioning, to further aid the internalisation of the application of the kata within a traditional civilian context, etc then it will shift his kata practise toward the self-protection side of things. The intent of the individual and how what they are doing fits within their wider study will also play a part. Again, its your baby, I am just trying to share what I saw within it, not rewrite your initial concept, hope that's clear. I would welcome further development of this as I truly believe its the first model that I have encountered that shows WHY there is so much confusion and argument about the notion of 'what is valid/ best for what'. Your thoughts are very welcome and much appreciated. As I think I say in the podcast, the idea behind the map is not to provide answers but to ensure people have a framework for considering the question i.e. what is the purpose of this particular part of training? What is the desired outcome? What skills or attributes are we trying to develop here? And so on. It is certainly possible to go a little deeper with things though and the points you have raised are very valid and relevant and certainly show a deeper use of the initial concept. I really appreciate you sharing your thoughts. I think this is very much on point :-) I think trying to be perfectly prepared for the “mythical super fight” leads to the problem you indentify i.e. “but what if I do get caught in an ankle lock in a real situation? If I don’t cover ankle lock escapes I’m not fully prepared!” I agree with you and Michael Rust in that it is better to have a smaller number of well honed and focused techniques that to try to prepare for everything. Absolutely. I also would say that it is impossible for any one person to be an expert in everything. That’s why it is important to state what our training goals are practise accordingly. One thing that’s really came across in this thread is that all of the participants are clear on their individual training goals and all seem to acknowledge that training has many benefits away from self-protection. No one here is trying to make artificial links back to self-protection for all areas of training. Fun and health and fitness have been stated, quite righty, as being very valuable. In the wider world, I do see a reluctance to be open about this though. And it is a shame that self-protection skills are sometimes seen as the only valid measure of value. I feel this leads to an ignoring of the other areas of training, and the “reinvention of violence” I talked about in order to justify the practise of things where there is no strong link to self-protection. We should be able to be clear on the goals of those other forms of training and hence their inherent independent value. That we all confusion is avoided and training is focussed and goal driven; as it seems to be for all in this thread. Absolutely. I also would say that it is impossible for any one person to be an expert in everything. That’s why it is important to state what our training goals are practise accordingly. I'm lucky to have John Skillen just down the road and a former BKK / IFK kata champion in the same town. If people want SP or Budo rather than knockdown training, I point them in the right direction.